My friends and colleagues have always harped to me how great Leon: the Professional was and whether it was some cosmic algorithm or my laziness, I’ve never had the chance to experience it… until now. Needless to say, I was missing out on something and to make the experience even more memorable, I had the pleasure of viewing it on Blu-ray as Jean Reno stars as Leon with a standout performance by a young Natalie Portman as Mathilda. At the helm of this movie is Luc Besson, director extraordinaire who really knows how to utilise not only the camera but certain scenes in the movie which balances the action sequences quite well. Although we have been spoiled with action films from Hollywood, Besson doesn’t generally follow the standard formula, even though action lovers are rewarded with some amazing gun blazing battles. For the uninitiated like myself, the story stars Jean Reno as Leon, a professional hitman whose life is soon about to change. We learn that Leon’s neighbour is Mathilda, a young girl who is abused by parents and when her parents and younger brother are killed by a ruthless gang leader called Stansfield (Gary Oldman), he does the most unexpected thing and takes Mathilda under his wings. As opposed to the father figure that Leon wants to be for Mathilda, she on the other hand wishes to be trained by Leon in order for her get revenge on Stansfield. This is the crux of the movie and although he lives by a strict code of murderous ethics and considers him a “cleaner” by ridding the world of bad people, Mathilda still contains that innocence which she wishes to discard that causes an interestingly relationship between the two. I love how Besson gets into the headspace of Leon as a man who has been killing for longer than he can remember but now, his life has meaning and the chance of some normality with Mathilda. Can a violent killer be reformed or will Mathilda become another one of his unintended victims? Its questions like this that make Leon: the Professional such a gripping film from start to finish. Besson also made a great choice in the actors, especially Jean Reno who portrays more than just a black and white hitman with a personal set of ethics. On the other hand we have Natalie Portman, a young girl who wants nothing more than revenge on the man who murdered her little brother and this is probably one of her best performances to date. The only let down in cast is Oldman who is once again stereotyped as this seedy gangster like character who does have a couple of standout scenes which are extremely creepy. 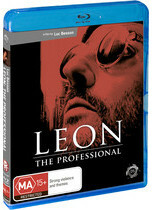 On Blu-ray, Leon: the Professional looks quite impressive for a film of 16 years of age with sharp images and some great clarity. At times, the colours in the movie are quite vibrant and then all of a sudden, you’re thrown into the grim and gritty world of crime as you are taken to a variety of grisly environments. There is a little bit of grain but considering the age of the film, it’s definitely nothing to worry about. Audio is DTS-HD MA 5.1 and really makes use of your surround sound, especially when the bullets start whizzing by. The dialogue is clear, the music has good levels and all in all, it works in conjunction with the story and the video. For extras, Leon: the Professional contains a wide gamut of interesting titbits and takes the viewer on an interesting journey of how this movie was created and LEON: 10 years on. This is how movies should be made and when people have forgotten about films such as The Expendables or Hitman, Leon: the Professional will still remain the standout title when all these other films have long been forgotten.